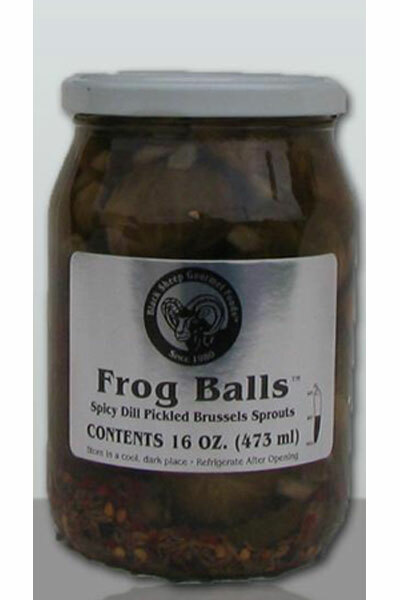 Product code: Atomic Frog Balls Category: Pickled Veggies. As part of the Mallows family of flowering plants Okra (aka ladies fingers, ochro or gumbo) is a flowering seed pod closely related to cotton, cacao and hibiscus. Never slimy, our pickled Okra is insanely crisp and delicious. Perfect as a garnish or salads. Choose from Hot or Mild. Different from the Frog Balls, these are very mildly pickled with a medium crunch. Salad Perfect. These delightful long green beans harken back to a time before steam canning when pickling vegetables was the main method of preserving. Very crisp, wonderful in salads, cocktails or for an “out of jar experience”. More than just for Chinese dishes, excellent in salads, cocktails and snacking. Perfect chopped in Potato Salads. From our favorite pickle packer comes these mildly hot & spicy pickled green beans, packed with a Red Fresno Pepper and a good measure of crushed red pepper flakes. 100% All Natural and a healthy snacking alternative. Crisp and delicious, harvested at the peak of flavor. So irresistible you’ll be tempted to finish the entire jar. A sensational garnish, relish tray item or appetizer that also adds an elegant touch as a swizzle stick in a Bloody Mary. Looks like a cross between and olive and a green grape these little toms are PACKED with flavor. Enjoy them as an alternative garnish in a martini or sliced in salads. Perfect popping snack. Savor the complex flavor. Wonderful blend of seasonings and herbs make these quite nice in all sorts of uses.